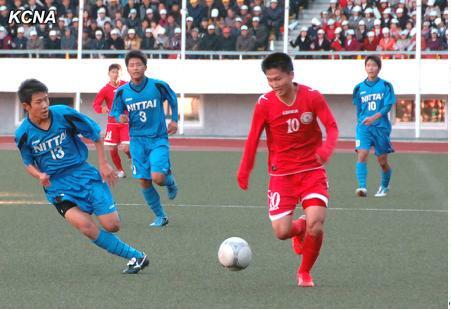 Pyongyang, November 8 (KCNA) — Men and women’s football matches between the sports university teams of the DPRK and Japan took place at Kim Il Sung Stadium on Thursday and Friday. 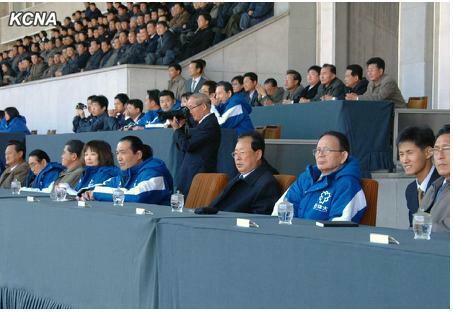 Among the spectators were Ri Jong Mu, minister of Physical Culture and Sports, Ri Chang Gun, vice department director of the Central Committee of the Workers’ Party of Korea, Ma Chol Su, secretary general of the DPRK-Japan Friendship Association, Sin Tong Gyu, rector of Korea University of Physical Education, officials concerned, football experts and fans and Pyongyangites including youth and schoolchildren. The delegation of Nippon Sport Science University headed by Managing Director Kenshiro Matsunami also watched the matches. The football players made the most of their team tactics. The spectators enthusiastically applauded the players when they had scoring chances through excellent teamwork that led to good opportunities for shoots. The team of Korea University of Physical Education won in the men’s football match and the women’s match ended in a goalless draw. Posted in Senza categoria on novembre 8, 2013 by calciocorea. Con l’ingresso in campo all’86 nella partita contro l’Aarau, Pak Kwang-Ryong segna il suo nuovo esordio nella Super League Svizzera con i campioni in carica del Basilea. Entrato sul risultato negativo di 1-0, il coreano è stato protagonista del gol del pareggio fornendo l’assist (con una “spizzata”) a Marco Streller, autore del pareggio. 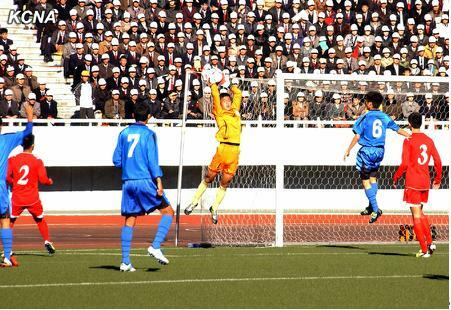 Posted in Senza categoria and tagged pak kwang ryong on novembre 6, 2013 by calciocorea. Posted in Senza categoria on novembre 6, 2013 by calciocorea. 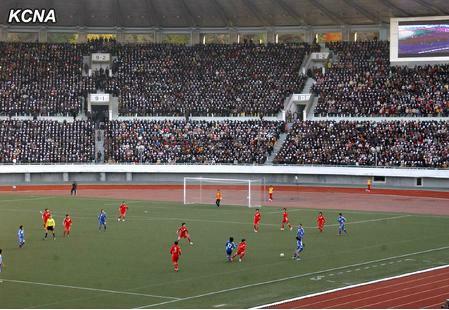 Pyongyang, November 5 (KCNA) — Men’s and women’s premier soccer league matches took place in Pyongyang in October as part of the DPRK Championships. Competing in the men’s league were ten teams including April 25, Hwaebul and Mangyongbong and in the women’s league 12 teams including April 25, Amnokgang and Myohyangsan. The titles in the league matches were taken by men and women of the April 25 team, with results of five wins, three draws and one defeat in nine matches for the men’s event and nine wins and two draws in eleven matches for the women’s event. Mangyongbong and Amnokgang came second in men’s and women’s events respectively, while Hwaebul and Myohyangsan third. The matches were held on a round-robin basis, and a total of 299 goals were made in 45 men’s and 66 women’s matches, an average of 2.6 scores per match. So Hyon Uk and Kwon Song Hwa of April 25 were selected to be best man and woman players, O Jin Hyok of Hwaebul and Ra Un Sim of Amnokgang top scorers and Ri Kang of April 25 and Choe Kum Ju of Ponghwasan best goal-keepers. And the prize of morality went to the men’s team of Mangyongbong and the women’s team of Kalmaegi. The recent league matches marked an important occasion in further improving each team’s technique and tactics. Posted in Senza categoria and tagged dpr korea league on novembre 6, 2013 by calciocorea. Pyongyang, November 4 (KCNA) — An agreement on the opening of the Pyongyang Representative Office was signed here on Monday between the DPRK-Japan Friendship Association and the Sports Peace Community Association, a specified non-profit undertaking corporation of Japan. Present at the signing ceremony from the DPRK side were Secretary General Ma Chol Su and other members of the friendship association and from the Japanese side Kanji Inoki, member of the House of Councilors of Japan and chief director of the Sports Peace Community Association, and his party. Ma Chol Su and Kanji Inoki inked the agreement. The representative office will act an agent for contacts and businesses to ensure exchange and cooperation in sports and other fields between the DPRK and Japan and thus contribute to creating the atmosphere of friendship between the two peoples. It is located in Central District of Pyongyang. Kanji Inoki told KCNA that he was very pleased with the opening of the representative office in Pyongyang. JAKARTA (4 Nov 2013) – Following their thumping win over Kyrgyzstan last week, the Indonesia national side has lined up a match against DPR Korea’s April Twenty-Five Sports Club next week. April Twenty-Five or 4.25 is one of the most successful clubs in DPR Korea and will provide a stern test for Indonesia as they gear up for the 2015 Asian Cup qualifying match against China at the Shanxi Stadium in Xian. The match against April Twenty-Five will be played on 9 November while the game against China will be on 15 November 2013. “We are optimistic for the game against China. I thought that we played well against them in Jakarta and I’m hoping for more of the same if not better when we take them on in Xian,” said Indonesian coach Jacksen Tiago. 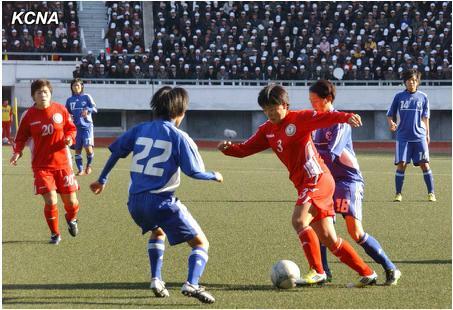 Pyongyang, November 2 (KCNA) — A U-14 women’s friendly football match between teams of the DPRK and China took place at Kim Il Sung Stadium here on Saturday. 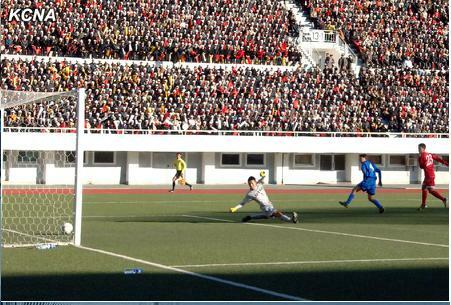 The match ended in 3:1 with victory for the DPRK. We learned a lot of things from the match, which was significant for both teams. The DPRK team is characterized by energy and speed. Each player of it is very skillful. The player No. 22 in particular was a big threat to my team in the match. I hope that the two teams would jointly make bigger progress through intensified exchange. Posted in Senza categoria on novembre 3, 2013 by calciocorea. A grassed football field is built in the compound of the Kim Chaek University of Technology. Encouraged by the Party’s policy to make the country a sports power, too, officials, teaching staff and students started dressing grass on the earthen soccer field since last August. An emulation drive was launched among faculties to speed up the project. In a short span of time seed was sown in the soccer field of 8000 square meters. As soon as green sprouts began shooting out, they took a good care of the grassed field. Last Sept. 27, the day of the University’s founding anniversary, the first football game was held in the grassed playground. Posted in Senza categoria on novembre 2, 2013 by calciocorea.